Check out new slots online like The Sky's the Limit. Ladies and gentlemen, the captain is currently preparing to take off and we should be on the runway in just a matter of minutes. It’s time to raise your folding trays and make sure your window shades are up. All hand luggage also needs to be stored away correctly. It won’t be long before we’re up in the clouds and trying to see just how much money you can win. The pilot would just like to wish you luck. Hopefully, the sky’s the limit! Core Gaming has decided to take us up to the dizzying heights to be with the birds and see if you can be luckier at a higher altitude. The current world leader in developing HTML5 games, their casino slots all provide an unforgettable experience for gamers. 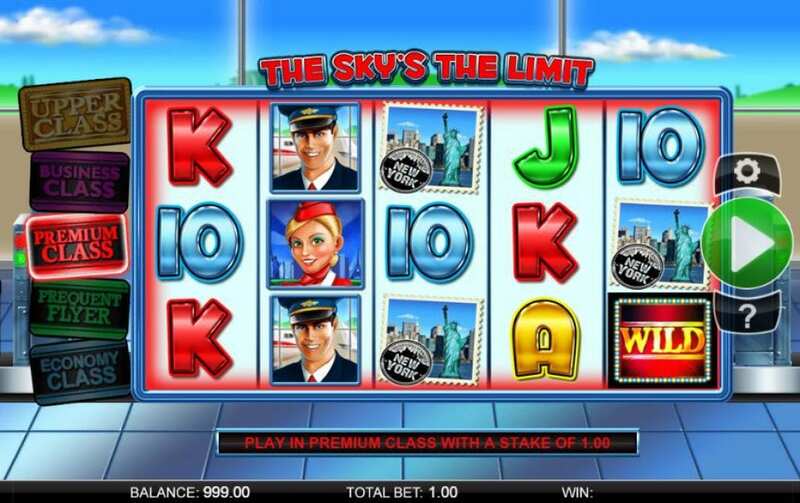 You’ll be able to play The Sky’s the Limit on any mobile device or on your desktop. If you enjoy this one, you might like to try some of their other titles, such as Balthazar’s Wild Emporium and Rolling Stone Age. Get more tips when you spin to win slots games from Core Gaming! In this game, you’ll be able to start spinning before you have even boarded the plane. The action takes place in an airport’s departure lounge, but don’t worry this isn’t the usual airport that stresses passengers out. The game’s lounge is bright and welcoming, and you could easily while away a few hours spinning here. You’ll see five reels and twenty pay lines. Unlike other games that give you regular stakes, you get to pick your flight class: economy, frequent flyer, premium, business or upper class? Go fly and travel when you play the best 3D slots of today! You might be able to take advantage of some bonus features before your flight is ready to board. · WILD SYMBOL – The Wild symbol is simply the word “wild” and this can replace any symbol except other bonus ones. · FREE SPINS – If you are spinning in Business Class, you might win an upgrade. This takes you to the Upper-Class level and you will also be awarded five free spins. · UPGRADE SYMBOL – The Upgrade symbol might drop onto the fifth reel. If so, you’ll get a free spin in the next class level as well as five free spins. · IN A SPIN FEATURE – You need to spin three In A Spin symbols to activate this feature. You’ll get a multiplier and a mystery prize! · SUITCASE FEATURE – You’ll be taken to a new screen with a conveyer belt of suitcases. Choose a suitcase and you’ll get the reward that was hiding inside.